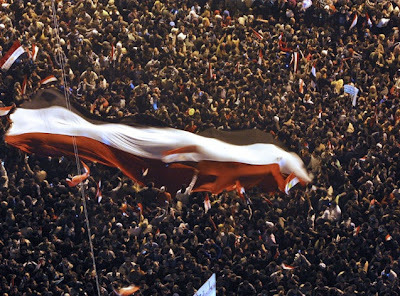 Village View Post: The Revolution in Egypt: Goodbye Mubarak! The events in Egypt over the past two weeks, culminated with the resignation of President Hosni Mubarak, and was being watched with apprehension in Israel. The media, both internationally and in the US, have focused on the brave young people of Egypt that forced the resignation of Mubarak. On Friday all of the Hebrew newspapers in Israel led with the developments in Egypt. They were planning to lead with the economy until it was announced that President Hosni Mubarak was about to make a dramatic speech- which, according to several international news outlets and even according to the CIA – was going to be handing in his resignation as president. On Sunday, the first edition of the Israeli newspapers since Mubarak’s resignation on Friday, all the papers carried historic front pages, reporting in-depth and at length on events in Cairo. They all provided a plethora of commentary and analysis, the bulk of which carried the same message: Congratulations, Egypt. In Israel Hayom Newspaper (Israel Today) Dan Margalit writes that contrary to popular opinion, Israel is not opposed to Egyptian democracy as long as the peace treaty between Cairo and Jerusalem is maintained. “Hosni Mubarak did not see three million of his countrymen who packed Cairo’s Tahrir Square. He spoke above their heads. He saw history before him, not the opposition. They waited for him to finish his speech before realizing that their hated president lost, but they had yet to win. It is as if they were forced to drink a half-cup of tea, and a half-cup of coffee. The masses who gathered in the square demanded to see Mubarak far from Egypt’s borders, but they could not formulate a position as to what they wanted beyond this. Vice President ‘Omar Suleiman requested that the crowds disperse and return home. Mubarak’s speech was respectable, but in practice, it left the door open to potential chaos. When Anwar Sadat was assassinated 30 years ago, Mubarak took his place with clear-cut authority to rule. In many respects, Mubarak’s regime was a direct continuation of that of his predecessor. There was an assassination, but no coup. This time, there is no assassination, but there is certainly a coup. Nobody is capable of knowing what will transpire in the Land of the Nile. It is unclear whether the army will take over the country just as it did in the original coup of 1952, which did away with the monarchy and installed as its leaders Mohammad Nagib and Gamal Abdel Nasser. It is unclear whether the military coup would harm its popularity in the eyes of the masses gathered in the square, masses which still hold the army in high regard. It remains unclear whether this is a new version of the original officers’ coup from nearly 60 years ago or whether this is the beginning of a long process that will culminate with Egypt’s abandonment into the hands of the Muslim Brotherhood. Israel has never opposed democracy in the largest Arab country. It simply placed a higher priority on preserving the Israeli-Egyptian peace treaty than it did on Arab democracy. Israel’s priorities have not changed, but with Mubarak’s forced ouster, a disturbing question remains unanswered: Can the leaders of both countries repeat the famous words uttered during the signing of the peace treaty – ‘no more war, no more bloodshed". Despite the uncertainty surrounding the political situation in Egypt, one thing seems clear: Egypt and indeed the Middle East will not be the same after February 2011. This will apply even if those in Israel and elsewhere who are pushing for continued military, as opposed to civilian, control and for ‘democracy'. Those governing Egypt will henceforth have to be more responsive to the public will. The package of regional policies pursued by the Mubarak regime lacked popular legitimacy. This included the closure imposed on Gaza, support for the Iraq War and for heightened bellicosity toward Iran, and playing ceremonial chaperone to a peace process that became farcical and discredited. Insisting on Egyptian adherence to the peace treaty with Israel is a legitimate position, has international support, and also accords with both Israeli and Egyptian interests. The treaty has saved lives on both sides, neither of which relishes the prospect of renewed military conflagration. Since signing the accord with Egypt, Israel has conducted several large-scale military campaigns against Lebanon and against the Palestinians, launched bombing raids against Syria and Iraq, and conducted high-profile assassinations in Jordan and the UAE – and that is only a partial list. In the end, Egypt could turn into a major Israeli game-changer. If the regime that replaces President Hosni Mubarak is led by the Muslim Brotherhood, then Israel will have to begin preparing for the possibility that a future regional war could involve not only Syria and Hizbollah, but also Egypt. I didn't know anything about this until now. It's a good thing I am not in Egypt.